A superb overdrive, but only the truly tone obsessed will justify the extra outlay over the S Series for the extra sonic integrity. That might just be you. Range of overdrive. Rich harmonics. Clarity. This is the first in the new upmarket F Series range from revered brand Providence, as the 'Free The Tone' range is phased out. We get VNS (vitalized noiseless switching) to eliminate pops when turning on and off, while DCG is double-contact-grounding on the jacks for improved connection and reliability. You also get the Vitalizer circuit which is a super-plush buffer that, unlike 'normal' buffers, responds to input impedance in a similar way to the input stage of a good valve amp, according to designer Yuki Hayashi. The most obvious result is no tone sucking when the effect is turned off, while clarity and dynamics from the guitar are exceptional, even with long cable runs. Inside, everything is soldered directly to custom PCBs, but metal fixings and the switch protector minimise the risk of damage. The all-important IC chip is disguised with plastic. 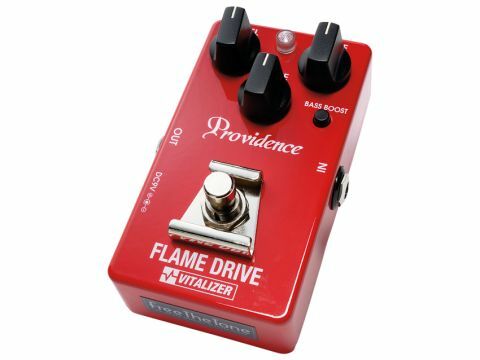 It's softer around the edges than the rock-rhythm loving Sonic Drive; it's less mid-heavy and has the impression of more gain than the blues-leaning Stampede OD, perhaps because it retains a sizzly, Marshall-like edge. It's not as overtly 'rock' as the Heat Blaster, naturally. It'll clean right up when you roll the guitar's volume back so your guitar never, ever gets lost in the pedal. The 'bass boost' switch is useful for fattening single coils, or adding extra low-end resonance if you're using a little amp/cab.